(PhysOrg.com) -- Rising levels of antidepressants in coastal waters could change sea-life behaviour and potentially damage the food-chain, according to a new study. Research into the behaviour of shrimps exposed to the antidepressant fluoxetine, showed that their behaviour is dramatically affected. The shrimps are five times more likely to swim toward the light instead of away from it - making them more likely to be eaten by fish or birds, which could have devastating effects on the shrimp population. “Crustaceans are crucial to the food chain and if shrimps’ natural behaviour is being changed because of antidepressant levels in the sea this could seriously upset the natural balance of the ecosystem,” said Dr Alex Ford from the University of Portsmouth’s Institute of Marine Sciences. The research is published in the journal Aquatic Toxicology. The study found that the shrimps’ behaviour changes when they are exposed to the same levels of fluoxetine found in the waste water that flows to rivers and estuaries as a result of the drugs humans excrete in sewage. Dr Ford’s research was motivated by a species of parasite which can alter the behaviour of aquatic creatures through changing serotonin levels within the brains of the organisms. Serotonin is a neuro-hormone found in many animals, including humans, known to control types of behaviour, such as modulating mood and decreasing anxiety. Drugs to combat depression in humans are often designed to target levels of serotonin which led to the question of whether they could also alter the behaviour of marine organisms. Prescriptions for antidepressants have risen rapidly in recent years, according to the Office for National Statistics. In 2002, there were 26.3 million antidepressant prescriptions handed out by doctors in England and Wales - yet the environmental effect of pharmaceuticals in sewage has been largely unexplored. Dr Ford is hoping to carry out future research on a number of other prescribed drugs on the market known to affect serotonin. 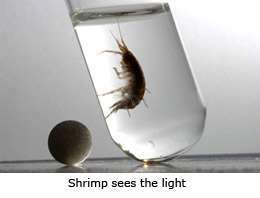 Ironic, anti-depressants cause suicidality in humans and now in shrimp too.